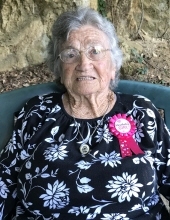 Mrs. Ina Bertha Hayes Earp, age 95 of Boomer, passed away Sunday, April 14, 2019 at Wake Forest Baptist-Wilkes Medical Center. Graveside services will be held 11:00 AM Wednesday, April 17, 2019 at Beaver Creek Baptist Church Cemetery with Rev. James Hall officiating. Mrs. Earp was born July 2, 1923 in Wilkes County to Grover Cleveland Hayes and Mattie Johnson Hayes. She was an avid gardener and homemaker. Ina was known throughout her community for sharing baskets full of vegetables and flowers from her gardens. She retired from the manufacturing industry and was a life-long member of Beaver Creek Baptist Church. She was preceded in death by her parents, her husband; Ronald Blair Earp, a son; Jerry Nelson Earp, five sisters; Ruby Hayes Smith, Lexie Hayes Walsh, Irene Hayes Crawford, Helen Hayes Eller and Juanita Hayes Wyatt and three brothers; Clay Hayes, Parks Hayes and Earl Hayes. Mrs. Earp is survived by four grandchildren; Terri Diane Earp Jesenovic Gehringer and husband Earl, Ricky Blair Earp Jesenovic, Linda Sue Earp McClure and husband Doug and Leigh Ann Earp Nunn and husband Eric, five great-grandchildren; Kayla Diane Gehringer Michalik and husband Nick, Kenneth Aaron Gehringer and wife Nicole, Katie Mae Gehringer, Jeri Nicole McClure and Michael Jerrold Nunn, three great great grandchildren; Braxton Collins, Avery Gehringer and Mason Gehringer, a brother; Franklin Peeler Hayes and special caregivers; Barbara Gant and Nellie Rash and several special nieces and nephews. In lieu of flowers, memorials may be made to Beaver Creek Baptist Church cemetery fund PO Box 26 Ferguson, NC 28624. To send flowers or a remembrance gift to the family of Ina Bertha Hayes Earp, please visit our Tribute Store. "Email Address" would like to share the life celebration of Ina Bertha Hayes Earp. Click on the "link" to go to share a favorite memory or leave a condolence message for the family.